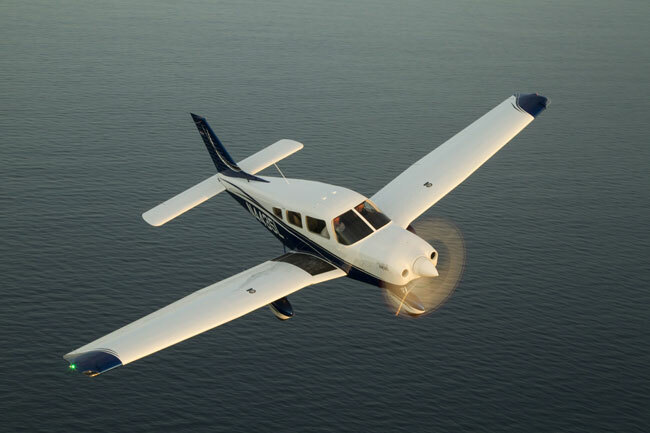 For decades, the most popular GA planes have been four seaters. That hasn’t changed. The reason is easy. Most owners want more room than you get in a two-seater, but they don’t need that much more room. A four-seater fits the bill perfectly. While few of these planes travels regularly (or at all) with all the seats filled, all of them can do just that, though many of them will require the pilot to fill the tanks only part way in order stay within weight limits. And, sure, there are fewer four-seaters available than there used to be, but the ones we have today feature a variety of technologies and advancements that would have been unimaginable back in the days when 10,000 planes were built every year. These days, the number of light planes built every year is usually close to 1,000. And the roles have changed. Many of the four seaters we feature here are used primarily as trainers. 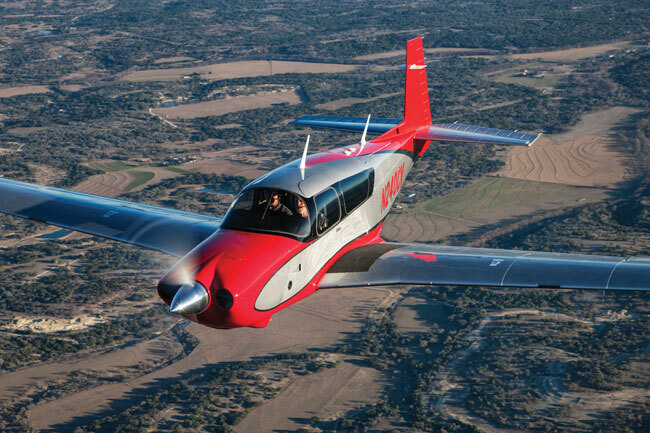 There are a couple of two-seat trainers available, but the days of the 150/152 dominating the training market are gone as well, and four-seat models have taken their place. They bring bonuses, too. Today’s four-seat trainers are remarkably sophisticated machines, almost every one of them featuring flat-panel avionics with digital autopilots and solid-state attitude sensors. Tens of thousands of new pilots these days have only heard of steam gauges. On top of that, these new entry-level four-place birds are getting new powerplants, though the adoption of them has been slow. Piper (Archer DX), Diamond (DA40 NG) and Cessna 172 JT-A all offer Jet-A burning versions of their popular four seaters. We’ll see how electric power changes the game in years to come. Beyond the entry-level trainers, the mix of four-seaters is staggeringly diverse. From machines built purely for traveling, like the Mooney Acclaim Ultra, to those built for banging around in the bush, like the Maule MX-7, there is a four-seater out there for just about every need. The Cirrus SR22 isn’t the fastest piston single in the skies, but it’s the most technologically advanced, with a built-in whole airplane recovery parachute system, available known ice protection, the best exterior lighting in its class and much more. It’s also the best-selling single in the world once again, despite a steep price of around $900,000 with all the bells and whistles. The latest model, the SR22 G6 has the Garmin G1000 NXi avionics suite, which is not only user friendly but has a bevy of cool new features, like visual approaches and a profile view even on an instrument approach. Customers can go with a turbo or normally aspirated ‘22, though the majority go with the turbo option, which makes sense because the SR22 comes into its own in the mid-teens, where built-in oxygen and the nicest cabin in the segment allow owners to cover a lot of ground in comfort and high style. In fact, there are a number of trim packages available for the SR22, so buyers can pick a package that suits their personality and favored mode of expression. Niche: Premium fixed-gear transportation plane. Bragging Points: Great cockpit, the parachute, high style and excellent visibility. 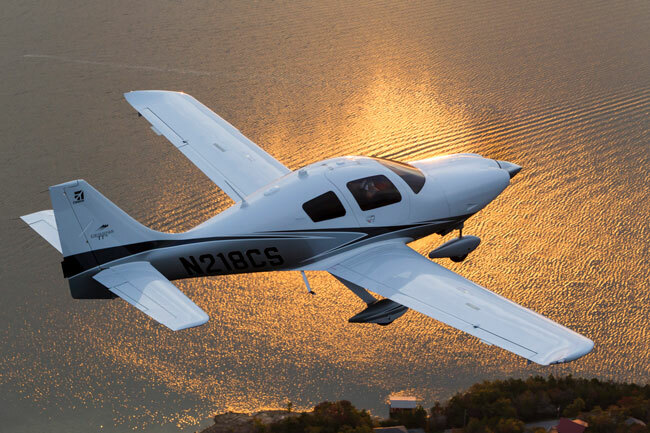 Great trade-in programs if you want a Cirrus Jet down the road. Tradeoffs: Premium price point, control feel that leaves something to be desired, less-than-best-in-class speed, okay range. Fun Fact: Cirrus has produced more than 6,000 airplanes since its first SR20 rolled off the line in 1989, and every one of them has had a whole airplane recovery parachute system installed. 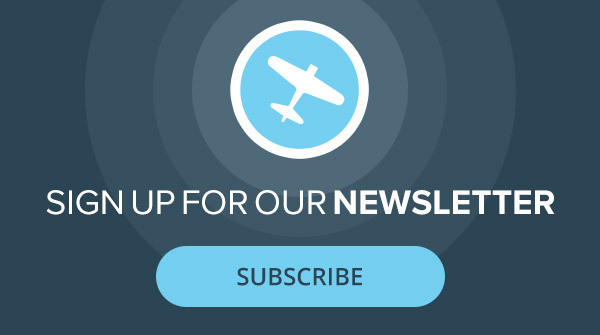 Learn more at Cirrus Aircraft. 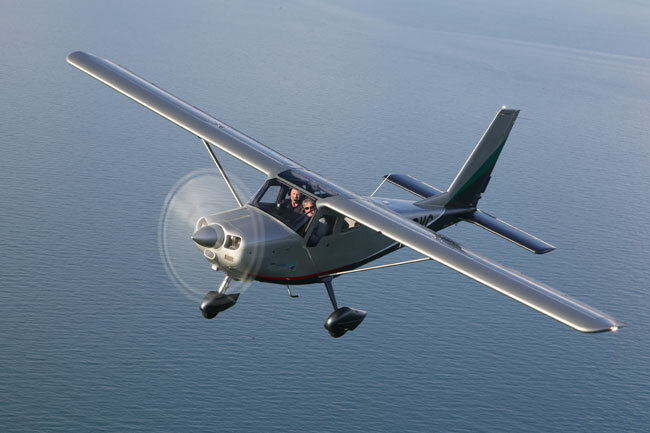 The TTx, a low-wing, all-composite, high-performance, fixed-gear speedster, might seem an outlier in the Cessna lineup of otherwise all-metal piston singles, and it is, in a way. A 230-knot max-speed cruiser that does 220 in the mid-teens, the TTx is a serious traveling machine that combines great speed and very good range with high-tech goodness and creature comforts to make for a compelling, no-holds-barred personal transportation plane. 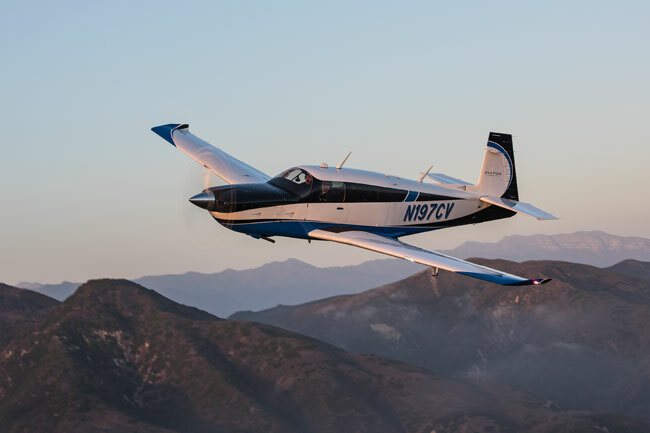 There’s no chute, as on the SR22; the gear doesn’t retract, as on the Mooney Acclaim Ultra; and the interior, while roomy, isn’t quite as spacious-feeling as the cabin of the Cirrus. To its credit, it’s a better hand-flying plane than the SR22, and its cabin beats that of the Mooney. And its ability to get from A to B quickly and with available FIKI icing protection with fixed gear makes it the best performer by a good stretch in its niche while being a joy to fly and a real head-turner on the ramp. Bragging Points: Fastest fixed-gear single, only single with G2000 touch-controlled electronics, great cabin, nice handling with true side-stick. Tradeoffs: No chute, visibility and roomy cabin not quite as good as its main competitor. Fun Fact: The TTx has had several names in its history. It was originally derived from the Lancair ES kit plane before becoming the Columbia and the Cessna Corvalis before settling in as the TTx. The Mooney Acclaim Ultra builds upon the world’s fastest Part 23 piston single and improves it in numerous regards. A metal and composite shell, chromoly-tubing fuselage retractable four-seater, the 240-plus knot Acclaim Ultra puts a 310-hp turbocharged Continental TSIO-550 to great use. But there’s more. To give its customers what they’ve been requesting for years, Mooney added a pilot-side door and improved the interior greatly. To do this, it replaced the forward sheet-metal section of skin with a composite shell that allowed it to add a second door while also making the windows larger and the doors longer for easier boarding and deboarding. The windows are also lower for better overall visibility. This year the model added the Garmin G1000 NXi, the latest flat-panel avionics suite. The result: An airplane that’s blazing fast, very well equipped (including FIKI) and more comfortable than ever. Bragging Points: Best speed in the world, greatly improved interior, comfortable seats, tremendous range. Tradeoffs: It’s smaller inside than an SR22 or TTx, and the gear adds complexity, weight and, down the road, maintenance. Fun Fact: The Acclaim Ultra can trace its roots back to the original Al Mooney-designed M20 of 1955, with a wood wing. It’s come a long way since then, but it’s still built in Kerrville, Texas. Learn more at Mooney International. In 2017, Mooney earned FAA certification for the Acclaim Ultra’s normally aspirated counterpart, the Ovation Ultra. Like the Acclaim Ultra, the Ovation Ultra gets the same new design treatment, with a fiberglass shell replacing sheet metal on the forward fuselage. This allowed Mooney to add a pilot’s side door, to make the windows bigger and lower all while staying at about the same weight. Like its turbocharged stablemate, the Ovation Ultra features the Garmin G1000 NXi and FIKI ice protection is available, as is air conditioning. The big difference between the planes is the power. While the Acclaim gets its power up high, the Ovation Ultra does its thing with more power—310-hp compared to 280-hp for the Acclaim Ultra. The Ovation Ultra is really fast. It is, in fact, the fastest normally aspirated production piston single, pushing the digits to 198 knots true. Other strengths include a tremendous range, greater than 1,400 nm, and terrific climbing ability. Bragging Points: Blazing fast, tremendous range, top-notch avionics. Tradeoffs: Like the Acclaim Ultra, not as roomy as its fixed-gear competition. Fun Facts: The six-cylinder Continental engine in the Ovation was originally installed under STC approval, but today it is part of the airplane’s type certificate. 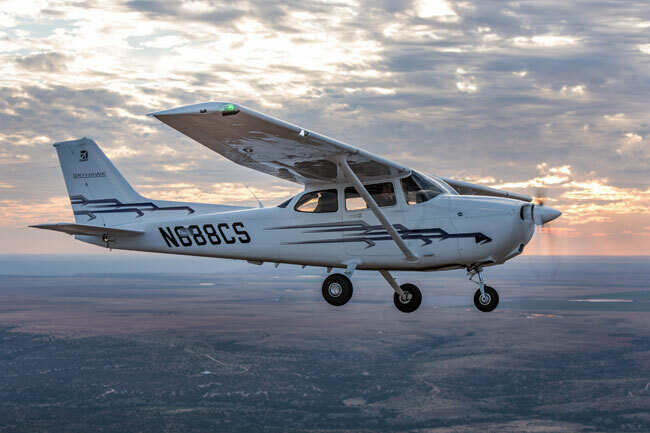 The Cessna 182 Skylane, an all-metal, high-wing, fixed-gear high-performance single, the larger, more powerful hangar mate of the Skyhawk, is one of the most popular planes ever, and for good reason. The 182 is a capable airplane that’s good or really good at just about everything a pilot could want. It’s not super-fast, though 145 knots true isn’t bad, but it boasts a great full-fuel payload (623 lbs. ), solid range, a great safety record, a comfortable interior and excellent visibility. Today’s Skylane features the 230-hp fuel-injected Lycoming six-cylinder engine with three-blade McCauley prop. As a cross-country airplane, the Skylane is a really solid medium-range performer, with a range that will let you cover some ground in style while carrying a big load. The airplane’s reputation was hard earned, and if anything, it’s added onto its abilities in impressive ways while adding a high-end finish and interior to go along with an outstanding panel. Bragging Points: Great useful load, advanced electronics, short and rough strip friendly, terrific safety record. Tradeoffs: Moderate cruise speeds, heavy in pitch handling. 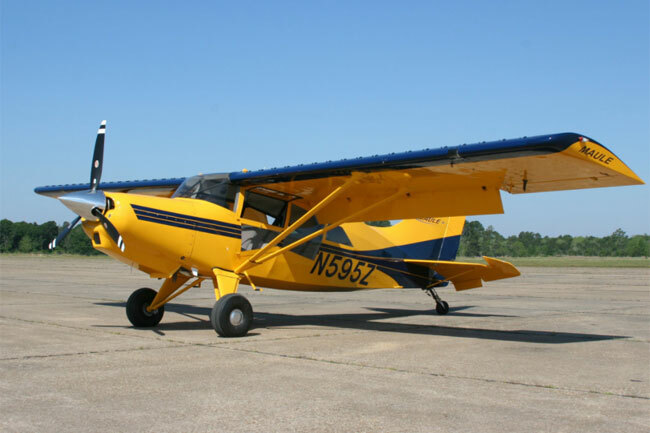 Fun Fact: Itself derived from the Cessna 180 all-metal taildragger, the 182 has lent its basic form to a number of derivative designs, including the 210 and by extension 205, the 206 and the 207, as well as the 182RG. The 206 and the 182 are still in production. 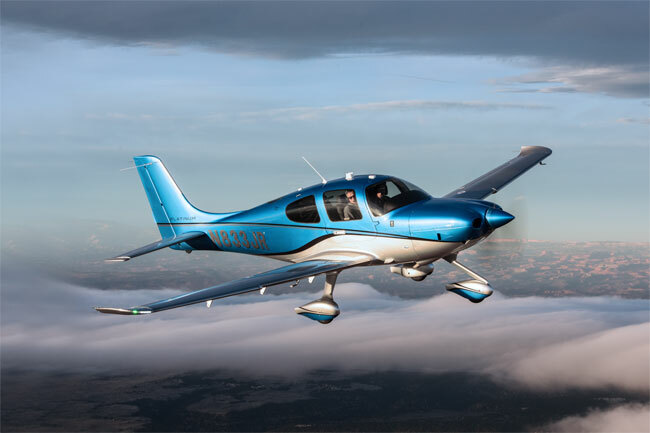 The most popular Cirrus by far is the 310-hp SR22, but the company is still producing its original Part 23 four-seater, the SR20. Certified in 1998, the all-composite, low-wing, fixed-gear single hasn’t found as strong a niche as its more powerful mate. The SR20 has strong competition among other four-place singles and, interestingly enough, with used SR22s. Last year, the SR20 got a new engine when Cirrus swapped out the original Continental IO-360 210-hp six-banger for a 215-hp Lycoming IO-390 four-cylinder engine. At the same time, the SR20 got a boost in useful load of 150 lbs. while its performance remained largely unchanged. With a cruise speed of 155 knots, the SR20 is a good cross-country plane, and while its short-field performance pales compared to that of the Cessna 182, it’s still capable of operating comfortably from a short strip at max weight. And in terms of style, comfort and technology, the ’20 is a compelling product, with a whole airplane recovery parachute system, the Perspective Touch avionics system by Garmin, ESP envelope protection and ADS-B In and Out, all on top of a stylish design and an interior and exterior with numerous upgrade paths. Bragging Points: Built-in whole-airplane parachute, the same cabin, windows and available air conditioning as the SR22, strong performance and good useful load. Tradeoffs: You might always be asking yourself why you didn’t buy an SR22. 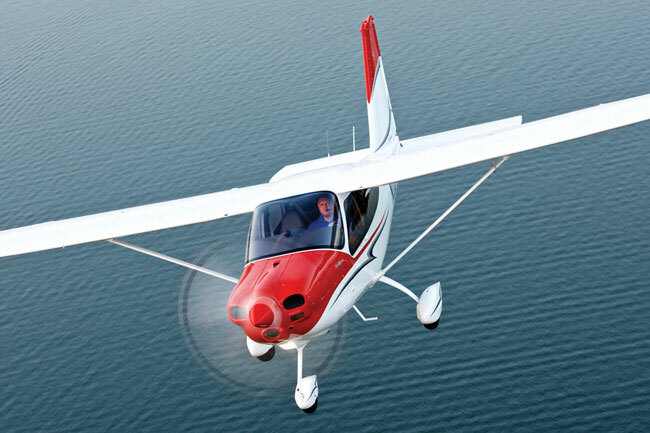 Fun Fact: The SR20 was the top seller for Cirrus only until the SR22 was introduced in 2001. 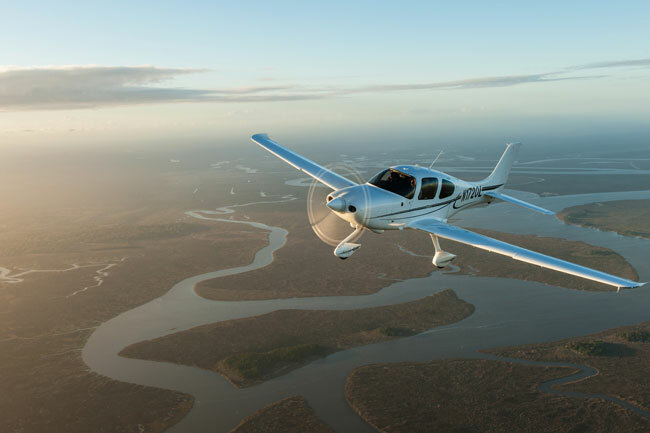 Cirrus has built around 1,500 SR20s. With its high-aspect-ratio wing, the all-composite DA40 XLT is a good climber, and with its Garmin G1000 cockpit, it’s a terrific cross-country and IFR machine for pilots who don’t need higher performance or the long missions that faster planes can accommodate more easily. 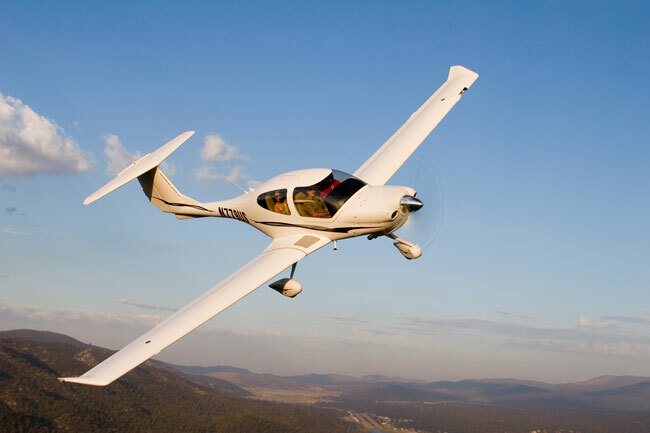 The DA40 also boasts one of the best safety records in the segment. Plus, with a 600-pound full-fuel payload, the XLT can carry quite a bit for a small plane. In addition to the XLT, Diamond is offering a couple of other versions of the DA40: the Jet-A-burning NG and the backcountry-ready Tundra. Bragging Points: Good full-fuel payload, safe and reliable, strong composite construction, unsurpassed visibility. Tradeoffs: Moderate cruise speed, average performance, warm interior on sunny days. Fun Fact: Diamond started in aircraft manufacturing building sailplanes (still does), and that heritage is evident in the long slender wings of Diamond aircraft. Learn more at Diamond Aircraft. The Tecnam P2010 is a four-seat, fixed-gear general-purpose single with a true mix of materials: the fuselage is of carbon fiber for that silky smooth outline, and the wings are conventional metal construction, using what the designer felt were the best materials for each job. The airplane is a compelling value proposition, with an attractive ramp presence, great roominess, terrific visibility, good load-carrying capacity and a good selection of instrument panel options. The P2010 has been joined by the MkII version, which makes use of the 215-hp Lycoming IO-390 four-cylinder fuel-injected engine. The more powerful engine increases cruise speed by a noteworthy factor over the Lycoming IO-360 outfitted model and increases the climb rate while keeping the plane right around its 600-nm range. 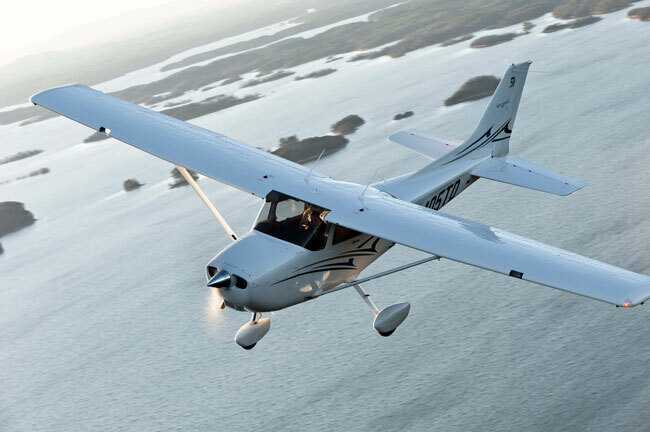 Those numbers, along with the P2010’s excellent useful load of better than 900 pounds, make the plane a competitor more of the Cessna 182 than the 172. Bragging Points: Pretty, plenty fast, roomy interior, good fuel efficiency. Tradeoffs: Some equipment, such as Garmin GFC-700 autopilot, is optional. Diesel training aircraft are beginning to look like they just might catch on after all. Piper’s bid for the space is, perhaps unsurprisingly, an Archer. The Archer DX makes use of a Continental CD-155 engine. In spite of running on 155 horses instead of the AvGas Archer’s 180, the DX’s performance numbers don’t suffer much. It loses a few knots in cruise and gains a bit of distance on the takeoff. The range, however, is another story entirely and turns the Archer into a cross-country machine that is much more competitive with some of the higher-powered offerings in the segment—though you still won’t be getting there very quickly. Bragging Points: Fuel-efficient diesel engine, significantly improved range. Tradeoffs: Moderate cruise speed, higher price than the non-diesel equivalent. Fun Fact: The Archer DX makes use of the same 155-hp Continental CD-155 engine as the Cessna JT-A. Learn more at Piper Aircraft. For years, Cessna has been working to develop a diesel-powered version of its 172 and 182 models, and in 2017 the company succeeded in getting the Jet-A-burning 172 JT-A across the finish line. Everything about the Skyhawk that makes it the most popular airplane of all time is present in the JT-A, as well. It’s an easy-flying, comfortable four-seat personal plane with great visibility—you’ve got to love the high wing—and decent room for four. That all said, if the marketplace sees the Lycoming-powered Skyhawk as more of a trainer than a personal plane, then it’s doubly true for the JT-A, a plane whose chief advantages come to the fore for high usage, especially training. The new engine, a Continental CD-155, has phenomenally low fuel burn, good high-altitude performance, controlled maintenance costs and strong takeoff and landing performance. Bragging Points: Easy availability of its fuel, Jet-A; great flying manners; decent room for four. Nice cruise speeds up high. Tradeoffs: Even more expensive for an entry-level plane than the standard 172. Fun Fact: The 172 JT-A’s air inlets up front and the three-blade composite prop are two easy ways to differentiate the gas-piston from the Jet-A version. The Piper Archer—a member of the PA-28 family—has been teaching students to fly for quite a few decades now. The design has evolved over the years. The current G1000-equipped iteration continues the training tradition admirably, adding improvements without losing the look and feel of the original models. Like many aircraft used primarily for training, the Archer boasts solid handling characteristics and a sturdy all-metal design. The low-wing takes better advantage of ground effect for easier and more predictable landings, a real benefit in the training world. Though it doesn’t have a particularly spectacular range, the decently sized cabin and reasonable cruise speed make the Archer a good prospect for some short cross country flying as well. Bragging Points: Long training history, sturdy and reliable, reasonably priced for the segment, easy landing characteristics. Tradeoffs: Limited range, moderate cruise speed, average overall performance. Fun Fact: The Archer was originally marketed as a personal transportation plane, and many pilots still use it for just that even though new Archers are sold predominantly to the flight training providers. Whatever Maules might lack in fancy touches, they make up for with ruggedness and utility. The M-7-235B is the oleo strut-equppied taildragger version of Maule’s M-7-235 series. Like its predecessors, the M-7-235B can be modified with floats and is more than sturdy enough for the backcountry. With a range of around 800 nm, the M-7-235B can go the distance, though it probably won’t be setting any speed records getting there. Another remarkable thing about this little plane is the service ceiling: the M-7-235B tops out at 20,000 feet. Like the MXT-7-180, the 235 has clamshell doors, quick-disconnect rear seats, and significant cargo space. For what the plane lacks in top end, it more than makes up for on the slow side, with a stall speed of just 35 kts. Bragging Points: High altitude flight, serious cargo space, STOL performance. Tradeoffs: Bare-bones avionics, minimal styling, limited full-fuel payload. Fun Fact: Maule is that rarity in aircraft manufacturing, a family-owned business that has been passed down from generation to generation, with construction and assembly done at the company’s factory in Moultrie, Georgia. Learn more at Maule Air. 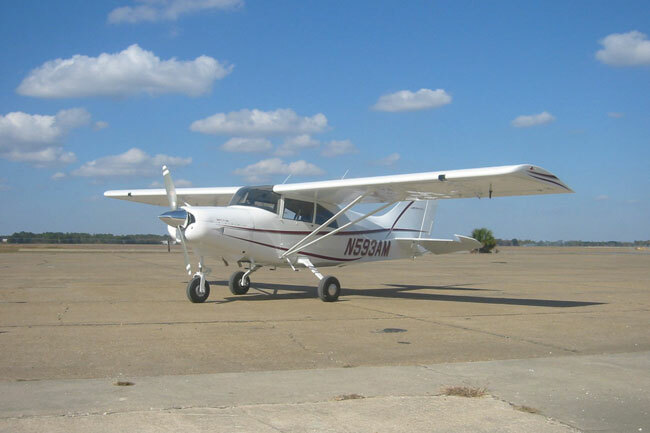 The most popular plane ever, the all-metal, high-wing Cessna 172 is also one of the most versatile. 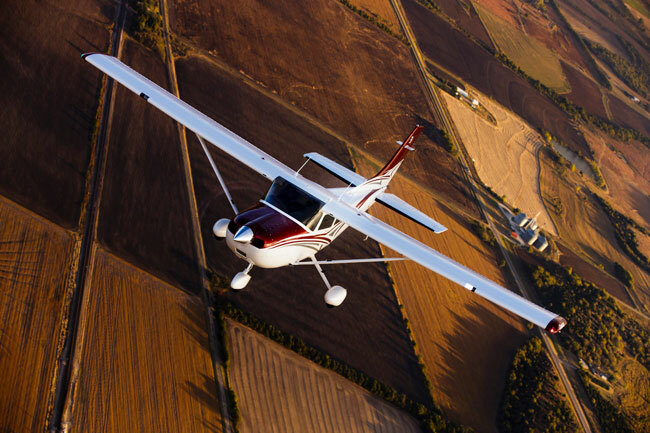 Since its introduction in 1956, Cessna has built over 50,000 of the planes. Today’s Skyhawk is a thoroughly modern airplane, with the sophisticated Garmin G1000 NXi avionics suite, stylish interiors, available air conditioning, a more powerful engine and stylish paint. 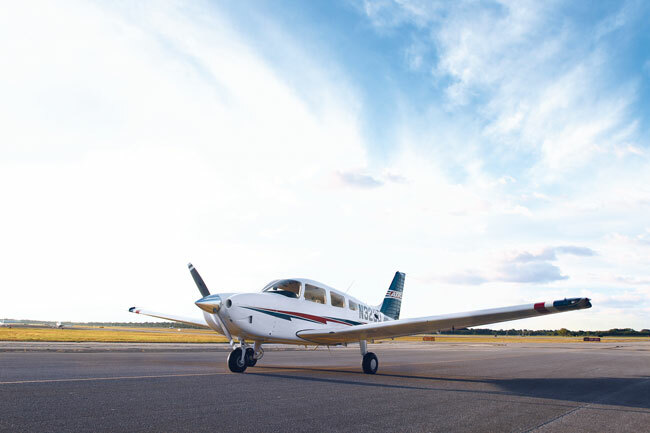 Once a popular personal transportation plane, the 172 today is more commonly used as a trainer, and Cessna regularly gets fleet orders for the plane, which flight schools love for its reliability, visibility and easy flyability. 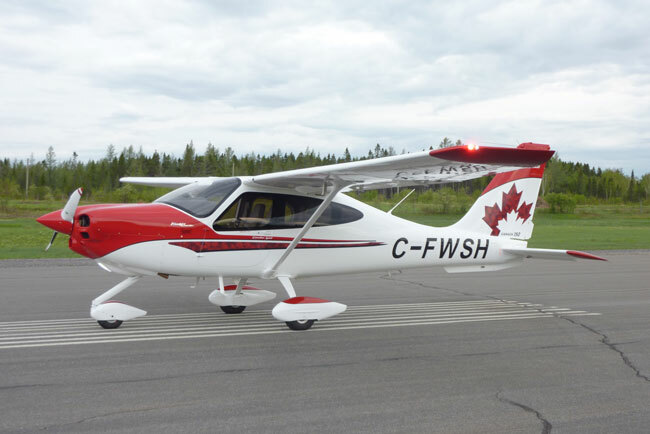 For the personal transportation pilot, the Skyhawk isn’t very fast, at around 125 knots true, but it is very well equipped, about as easy to fly as an airplane can be, and capable of doing reasonable distance cross country flying on a regular basis. It’s also a terrific IFR platform, and with the advanced Garmin panel up front, there’s a wealth of information for improved situational awareness and procedural flexibility. Bragging Points: Great reliability, silky smooth flying manners, advanced electronics, unmatched pedigree. Tradeoffs: Expensive for an entry-level plane, leisurely cruise speeds. Fun Fact: The 172 has survived at least three attempts by Cessna to create a replacement for it. The Vulcanair V1.0 is a high-wing, all-metal four seater that has been operating in Europe for a few years and has just arrived in the U.S. The newly FAA-certified V1.0, like the Piper Archer and Cessna Skyhawk, is a training and entry-level aircraft. And like its competitors, the Italian import isn’t particularly fast or rangy, but it does have a few key advantages, notably its payload and 900 ft/min climb performance. Unlike most of its direct competitors, the Lycoming IO-360 in the plane spins a constant speed prop, adding a bit of complexity for beginning pilots while also allowing them to select the best prop pitch for the phase of flight. Though it lacks the G1000 NXi avionics that is the de facto standard in current trainers, its Garmin G500 cockpit is a close approximation and it is IFR ready. Importantly, it comes in at a substantially lower price than its competitors. Bragging Points: Rugged construction, great price for the segment, good useful load. Tradeoffs: Moderate cruise speed, limited range. Fun Fact: According to Vulcanair, the V1.0 is regularly operated off of grass strips in Europe and has a great record for standing up to coarse and uneven terrain. Maule is all about versatility, both in construction and use of its aircraft, and the MXT-7-180 is no different. This four-seater is the nosewheel version of Maule’s MX-7-180 taildragger, and its performance numbers—which include tidy little takeoff and landing distances—are remarkably similar. With huge clamshell-style doors and 38 cubic feet of cargo space, it has a lot of room to easily stow all the backcountry gear you might need, especially if you pull out the quick-disconnect back seats. The MXT-7-180 can be equipped with an auto-fuel STC for unleaded Mogas, keeping fueling options open as well. Though it is possible to have the plane fully IFR-ready, the standard avionics package comes with old-school steam gauges. These planes, by the way, hold their value like gold in the used market, and Maules, which are built in Georgia, are much beloved by operators in the Alaskan bush. Bragging Points: STOL performance, cargo space, can use auto-fuel. Tradeoffs: Bare-bones avionics, minimal styling, okay cruise speed. Fun Fact: There are many possible Maule configurations, depending on the landing gear chosen, the gear configuration, and the engine/prop combination the buyer desires.